The letter K is a rather challenging one to bake. However, one of the main reasons I like to take part in blog challenges and events is to push myself to try recipes I wouldn't otherwise have made. I searched around for bakes starting in K and there were not very many at all, I toyed with making some Kiwi Fruit Muffins but in the end decided to attempt a Kugelhopf. Kugelhopf is a yeasted sweet bread usually baked in a fancy tube tin. Alphabakes is a blogger baking challenge run by Ros at The more than occasional baker and Caroline at Caroline Makes who is hosting this month. It was particularly fortuitous that I was contacted by The Craft Company to review some items from their website. The Craft Company specialises in cake decorations and cake decorating supplies including cake boards, cake boxes, cake decorating equipment, baking tins, ingredients and cake toppers, everything you might need for decorating cakes. 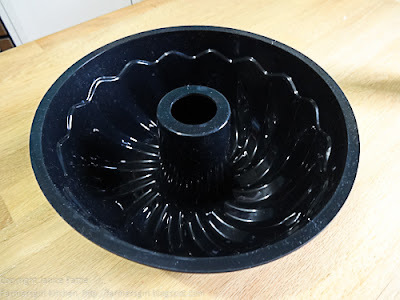 When I browsed around their site I found this 'large tube ring silicone mould' which is perfect for a Kugelhopf. 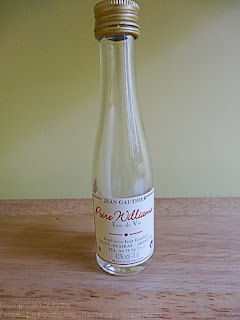 I also asked to review a bottle of PME Release-a-Cake which I felt might just be required for such an intricate mould. Delivery from the Craft Company was prompt and the items were well packaged, I couldn't fault them. Prices were also keen with the silicone mould costing £7.00 and the PME Release-a-Cake £2.85 for 236g. A range of delivery options are available. 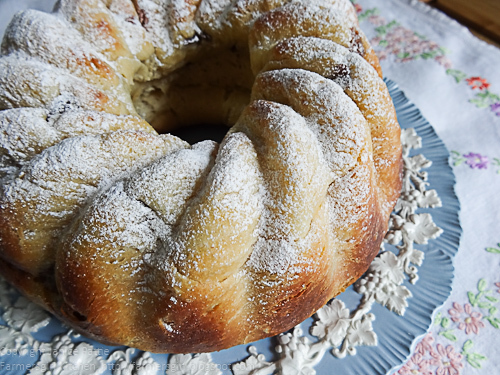 The Kugelhopf recipe that I used is one with an excellent provenence. It is a recipe by Dorie Greenspan, a well known US author, and comes from her book "Baking from my home to yours". I found the recipe on line at Leite's Culinaria I did make a slight change (regular readers will not be surprised by this!) I soaked the sultanas in a miniature of Poire William, a pear flavoured eau de vie (40% alcohol), that we brought back from holiday in France. 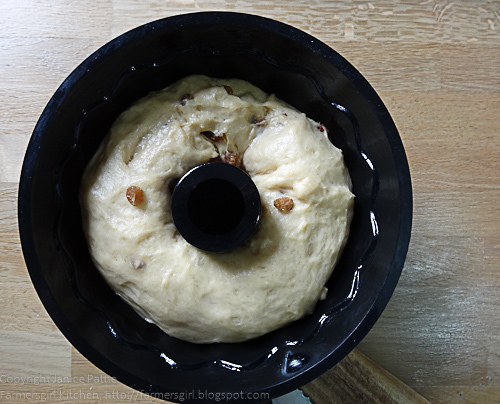 The dough is very similar to a brioche dough and is best made in a stand mixer, although it is possible to make it by hand. I don't have a dough hook for my vintage Kenwood Chef (something I'm planning on remedying very soon) so mixed the dough with the K beater which worked perfectly well - how very appropriate for this challenge! The process is not so much difficult and, while it takes a long time from start to finish, most of that doesn't involve you doing anything. 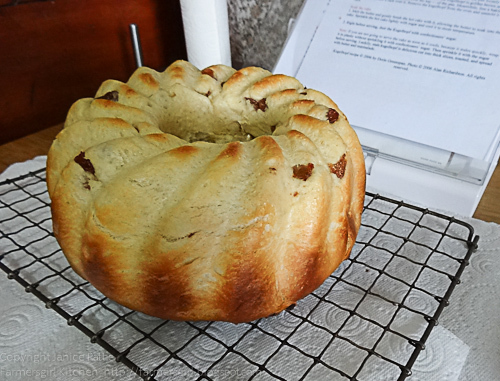 I started making the dough on Saturday morning and the Kugelhopf was baked and complete by Sunday lunchtime. 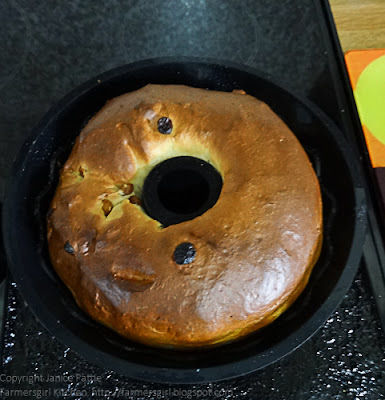 The Kugelhopf slid easily out of the mould which had been brushed generously with the PME Release-a-cake. The silicone mould was very well behaved, I supported it in an 20cm cake tin on a baking tray, mainly for ease of putting in and out of the oven, but it is quite a sturdy mould even without that. The verdict? 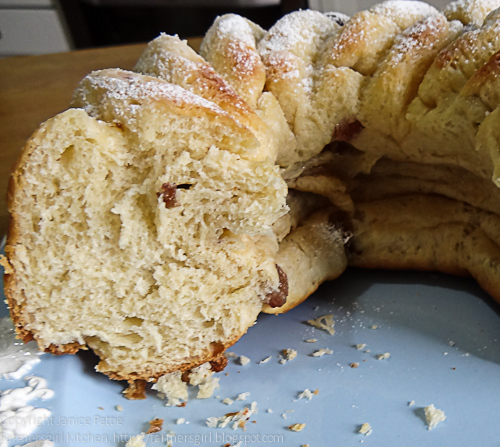 The Kugelhopf was a huge success, it was light, sweet and rich, the alcoholic sultanas don't overpower the soft bread. Everyone loved it and my mother-in-law said she preferred it to cake. I was very impressed by this recipe and by the silicone mould and PME Release-a-cake from The Craft Company. I chose products up to £10 from The Craft Company to review. I was not paid for this review and my opinions are my own. Looks lovely Janice. K is a hard one to choose, and I'm sure no one else will come up with Kugelhopf! I'd have to agree with your mother-in-law and say that a good sweet bread is much better than cake (most of the time). This looks delicious. I've previously steered clear of shaped moulds fearing that the bread wouldn't come out in one piece. Looks like the cake release stuff you used did the trick. Well done! That looks luvly, like I would enjoy it as well. Wonderful bake Janice, it looks very professional. Th soaked fruit sound like a nice touch too. I've been looking for a silicone tube mould for ages with no luck - although I really want a plain one. Thanks for the kind comments. The metal tube pans are very expensive, so this is a great alternative. This looks great Janice! 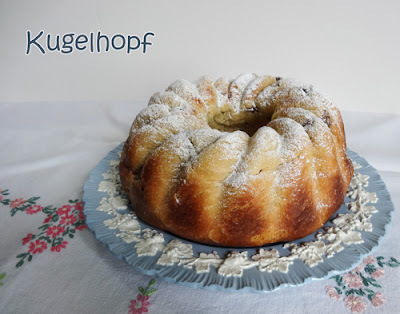 Kugelhopf is very satisfying to say, I could just go a slice! That looks absolutely gorgeous! I could really go a piece of that right now! The spray looks like a clever invention too! This looks wonderful, Janice! I never saw this way of spelling (it's Gugelhupf in the regions of Alsace, Southern Germany, and Austria where it originally comes from), but yours looks really gorgeous and must have been delicious also. I had this for the first time at Easter. I bought it at a local amazing bakery. It was beyond delicious! I'm not a cake lover so the texture of this was just perfect. Thanks for the recipe,I thought I'd have to wait till next Easter for the bakery to have it! Fab looking cake and cake tin! Why am I approached by the wrong companies, would have loved to test a cake tin (had to refuse some very inappropriate offers, lol). That looks lovely and I like the sound of the pear liqueur! Thanks for sending it to Alphabakes. Special K: How you've changed and how I haven't!